Update: The hidden Android menu button in the Pixel 2 is indeed a bug, Google confirmed on Thursday, just as we theorized. The company told CNET that the button's presence is not an intended feature, and that the bug will have a "fix" soon enough. If you've discovered the button or want to try it out for yourself on a Google Pixel 2, we suggest you do so now before it disappears for good. Are you an Android user who misses the old menu button – the one that used to be a defining feature of the operating system? You'll be happy to know it's still alive and kicking on the Google Pixel 2. However, it's hidden so well that it's taken a while for anyone to find it. It's the Luke Skywalker of user interface elements. Android Police was the first outlet to uncover it, and through 'purely accidental means' at that. To access it yourself, just click on the empty area to the right of the button for recent apps, close the corner of the screen, and an app-specific menu will (usually) pop up in all its glory. 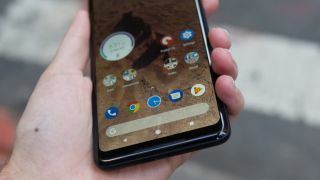 It won't work with every app, though, likely as a consequence of the feature's absence from more recent apps – because the menu button is absent from latter-day versions of Android itself. In fact, its oddly hidden placement suggests it may have accidentally been left behind from a rough draft of the Pixel 2 operating system. The fact that it sometimes doesn't work at all without a few taps lends credence to this hypothesis. Viewed in that light, its inclusion here is actually rather embarrassing. Now that the word's out, it's possible it may be not be long before we see an update from Google that removes it. But, it's possibly accidental reappearance has reminded us of its usefulness. As 9to5Google puts it, the subtly reincarnated menu button makes it easier to access features such as the share menu in the Chrome browser 'without any extra hand gymnastics.' Removing it now would thus arguably mean stripping the Google Pixel 2 of a useful feature. Only time will tell whether Google relents to or resists the popular demand. Meanwhile, enjoy it while it lasts – if it's still around when Google's new phone officially launches on Thursday.